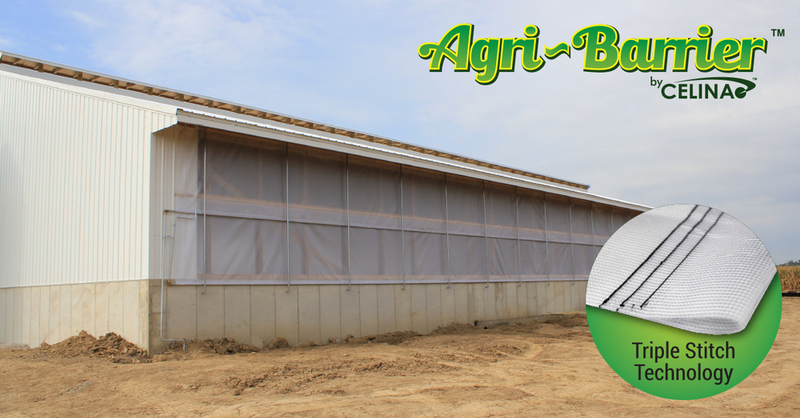 Celina Industries offers Triple Stitch Technology on their Agri-Barrier Barn Ventilation Curtains. Celina’s Patent Pending Triple Stitch Technology allows for an additional chain stitch row for added strength from wind, weather and continual use and come standard on all Agri-Barrier barn sides. These livestock curtains were engineered specifically for use on poultry barns, swine barns and cattle barns. The curtains are manufactured using UV Resistant Thread for additional longevity and are abrasion resistant. The material options for these curtains include Polyethylene (PE), vinyl (PVC) and insulated PE/PVC. Custom lengths are available to purchase at www.BuyCelina.com. Let us help you choose the best option by emailing: sales@celinaindustries.com or calling 1-888-324-0654.